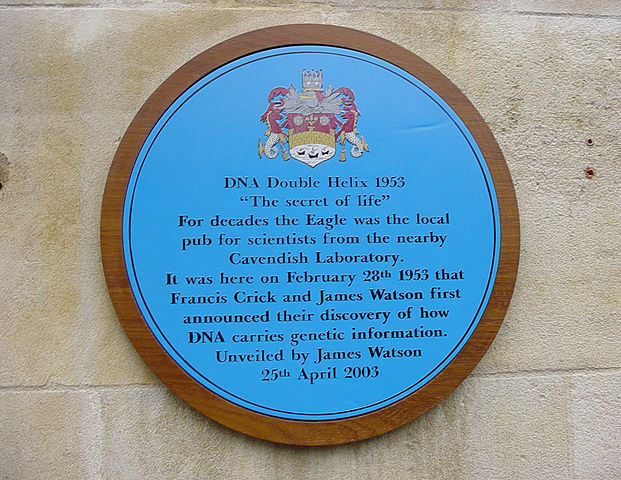 DNA is the molecule that contains the genetic code of all animals and plants and on the 28 February 1953 in the Eagle pub in Cambridge, Francis Crick interrupted the patrons' lunchtime to announce that he and James Watson had "discovered the secret of life". 'Rosalind Elsie Franklin' was born on 25 July 1920 at 5 Pembridge Place, Kensington, London, England and died of cancer on the 16th April,1958. 'Maurice Hugh Frederick Wilkins', was born 15 December 1916 in Pongara, North Wairarapa, New Zealand and died of cancer on the 6th October, 2004. Born of Irish parents, 'James Dewey Watson' was born 6 April 1928 in Chicago, Illinois. 'Francis Harry Compton Crick', was born on the 8 June 1916 in Weston Favell, Northampton, England. Franklin was head hunted in '1951' by John Randall, of the Medical Research Council Biophysics Research Unit at 'King’s college, London', to work on an x-ray picture of DNA taken by a graduate student Raymond Gosling, Wilkins assistant. In the November of 1951 Franklin gave a departmental seminar to bring the unit up to date on what she had achieved so far. In it she presented the A and B form data. In the audience was James Watson. After the seminar Watson caught the train back to 'Cambridge University' and, based on what he had heard and seen, he and Francis Crick built their first model of DNA. This was slightly unethical as they had a gentleman’s agreement that the team in London would work on DNA. Watson and Crick invited Franklin and Wilkins to view a DNA model that they had built. Franklin was furious and tore the triple helix model to shreds. Crick and Watson were banned from working on DNA. Meanwhile Franklin and Wilkins got bogged down with calculations and obsessed in trying to determine whether the DNA A form was helical. Unperturbed, Crick and Watson using some underhanded assistance gained enough information to started building their DNA model on Wednesday, 4th March and finished in the evening of 'Saturday, 7th March, 1953' in their room number 103 of the Austin Wing at the 'Cavendish Laboratories, Cambridge', Cambridgeshire . In '1962' Watson, Crick and Wilkins received the 'Nobel Prize' in Physiology or Medicine. They proposed that the DNA molecule takes the shape of a double helix, an elegantly simple structure that resembles a gently twisted ladder. 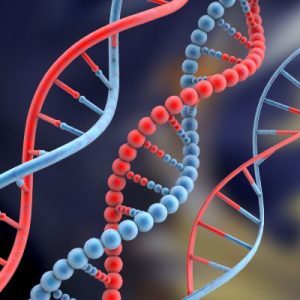 The rails of the ladder are made of alternating units of phosphate and the sugar deoxyribose; the rungs are each composed of a pair of nitrogen-containing nucleotides. In their Nobel lectures they cite 98 references, none are Franklin’s. Only Wilkins included her in his acknowledgements. Franklin died in 1958.